Kwan Jang Nim Daniel Segarra, 7th Dan, was a personal student of Grandmaster Hyun Chul Hwang, the son of Tang Soo Do Moo Duk Kwan's founder. Master Segarra has developed a unique style of Tang Soo Do called Moo Sa Do Kwan. He is the author of numerous martial arts books and publications and has been featured in numerous martial arts magazines. 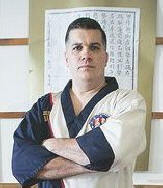 For more information about Moo Sa Do Kwan, you can visit his website at www.warrior-scholar.com. "Many Tang Soo Do practitioners have often wondered about the origin of the Moo Duk Kwan belt ranking system beyond the basic explanation promoted in most organizations. Here are my thoughts, ideas and understanding about the belt ranking system, it's beginning's and philosophy." 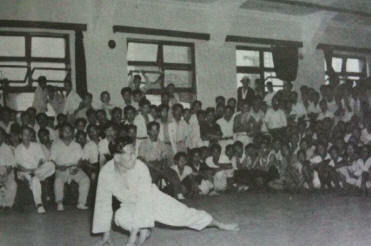 Originally, when Grandmaster Hwang Kee demonstrated Hwa Soo Do on October 14, 1959, he was photographed wearing a simple white belt. I'm not sure if that was consistent through his development of Hwa Soo Do, but after he met and consulted with other, more successful martial artists such as Lee Won Kuk, he definitely adopted the Gup and Dan rank system. The red stripe started in 1960 and symbolized Neh Gang Weh Yu or Strong Inside, Gentle Outside Um/Yang philosophy. Grandmaster was a dedicated student of the I Ching and philosophy. If you notice on the Korean flag (Tae geuk gi) you have the Red/Blue Um/Yang and the Trigrams, all of which are two upper bars with a center bar (Heaven, Earth, Water, Fire). The trigram bars have a different bar in the center. The Water a solid line and the Fire, a broken line. The Red stripe was inspired by this Um/Yang philosophy. Remember, the Grandmaster was born during the Japanese occupation and the South Korean flag was banned during Hwang Kee's youth. "The flag was first adopted as a symbol by the kingdom of Korea in 1882. During the Japanese rule of Korea (1910-1945), the flag was banned. The tae geuk gi was used as a symbol of resistance and independence during the Japanese occupation and ownership of it was punishable by execution"
The flag was a deep source of pride for him and encompassed the martial art philosophy (ship sam seh) in its design. To provide all this is our creed. Interestingly, in the current translation of the Chor Hak, they don't translate Hwal. They just say Hwal as in "The purpose of Moo Do is Hwal, to "cultivate ourselves", which I found odd since Grandmaster H.C. Hwang stressed how important it was/is. My interpretation of Hwal was living life to our fullest, i.e., exploring our full potential. Hwal is made up of two characters - water and tongue, meaning if you had a wet tongue you were alive. Remember the Moo Duk Kwan was constantly being developed and tweaked by Grandmaster Hwang Kee. In 1945 Korea was liberated but was a decimated mess that only five years later was at war with itself until 1953. Then tons of political corruption under Rhee until in 1960 he was thrown out after the uprising. So imagine having the largest martial art organization in Korea when all of this is going on. Keep in mind, Grandmaster Hwang Kee was falsely charged with being a traitor, hunted, eventually captured and tortured (waterboarded). So he had his hands full during the development of the Moo Duk Kwan. 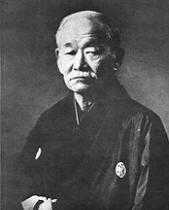 The Gup, Dan ranking system was developed by Kanō Jigorō, 28 October 1860 - 4 May 1938) the creator of Judo. Prior to that there were no ranking systems other than in the military which sometimes established rank or function by the color of the uniforms. Since the belts were part of the uniform, they occasionally matched the color of the uniform. 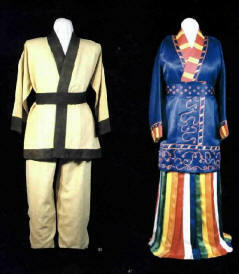 Evidence of this is the indigo trimmed uniform and belt the Grandmaster came across in a museum, and which he based the Moo Duk Kwan uniform after. Kano based his Dan and Gup (Kyu in Japanese) from the Game of Go. Go, known in Chinese as Weiqi and in Korean as Baduk, is an ancient board game for two players that is noted for being rich in strategy despite its simple rules. In Go, rank indicates a player's skill in the game. Traditionally, ranks are measured using Gup/Kyu and Dan grades, a system which also has been adopted by many martial arts, not just Tang Soo Do. Note the Dan Ranks range from 1-9 with 10th being a special title similar to most martial arts ranking systems. Kano's original use of the Kyu/Dan was eventually used by Funokoshi (Shotokan's founder) and made its way to Korea via the Koreans that trained in Shotokan and Judo (Yudo in Korean). The Gup system was simply a reversal of the Dan ranking. Starting at 10th Gup you progressed by eliminating numbers and as you reach Dan you climbed up the numbers. There are all kinds of philosophical concepts that fit with this like empty your cup from full to empty (Gup ranks) then filling it (Dan ranks) etc. * Kano's system was 1st to 4th Dan as testable ranks with 5th or above being honorary Dans only. Originally, Menkyo (Korean/Meon Ho) a form of certificate(s) was used before the use of belts came into play. It distinguished one's place in a school or art long before anyone ever thought about the use of belts. Typically classical schools (koryū) usually use the menkyo system while schools which base their practice on budō forms ("path, or way") typically use the Kyu/Dan. Schools in Japan usually were classified either as koryū or Gendai budō, meaning "modern martial way", which are modern martial arts that were established after the Meji Restoration (1866-1869). Koryū are the opposite: ancient martial arts established before the Meiji Restoration (sword arts, archery and battle field arts for example). Originally, many Dan members in Korea wore Black belts simply because there was an assimilation of different Kwans into the Moo Duk Kwan and they brought that with them, which eventually was standardized into the Midnight Blue. Even most 'Black' belts were Indigo Blue that was due to the fact that Indigo was the primary dye until Black dye began being imported from Europe. A fact most people don't know is that originally in Korea, you were not considered a 'Master' until 5th Dan.